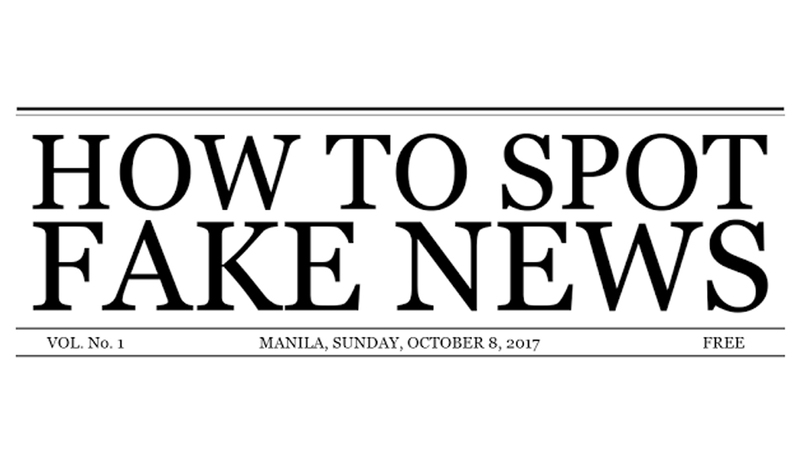 Today is as good time as any to start guiding people to spot fake news. When the Senate of the Philippines called for a hearing on fake news on October 4, netizens and television audiences of the televised hearing were surprised to find among resource persons people who used to be either bloggers supporting candidates in the elections or paid social media influencers who have crossed over to government, openly accusing legitimate and long-established media outfits of ‘fake news’ instead of ‘misinformation’ or churning our hate and trolling campaigns to disparage journalists or even private persons and cause them to feel abused and harassed, instead of sending flak to media with the end goal of having a news item updated to reflect facts, better vetted or verified details or information. Which was how democracy and freedom of expression used to work in the country, however limited. The hearing also passed on or mentioned without really discussing so many sensitive issues on freedom of expression and free press, such as right to reply, regulations for the internet, media, etc. that are essentially restraints to these freedoms that journalists and activists have fought so long and hard to uphold and preserve. And these may be dangerously lumped in a Fake News bill, since these hearings are supposedly in aid of legislation. While we come out with this infographic, we say there is no such thing as ‘fake news.’ News is news if it is true, factual, timely and relevant for whom they were made to be read, watch or heard. While the term is borne of money-fueled use of information and news to further political agenda in the past years especially in the 2016 presidential elections–a phenomenon, a sign of the times–we hope that this society will experience and learn the relevance of news and the media as the fourth estate and that the public is actually the fifth estate checking on the three branches of government and the media. So that there may be no more fake news–term and all. To what fruit these hearings shall bear, the public are still the most important element that may be able to protect or make more relevant and true the democracy and freedom of expression enshrined in the highest law of the land.